U.S. average temperature has risen and is expected to rise more – how much more depends primarily on the amount of heat-trapping gases emitted globally. Explore past and future U.S. warming. U.S. average temperature has increased by 1.3°F to 1.9°F since record keeping began in 1895; most of this increase has occurred since about 1970. The most recent decade was the nation’s warmest on record. Temperatures in the United States are expected to continue to rise. Because human-induced warming is superimposed on a naturally varying climate, the temperature rise has not been, and will not be, uniform or smooth across the country or over time. Evidence for the long-term increase in temperature is based on analysis of daily maximum and minimum temperature observations from the U.S. Cooperative Observer Network (http://www.nws.noaa.gov/om/coop/). With the increasing understanding of U.S. temperature measurements, a temperature increase has been observed, and temperature is projected to continue rising.1,2,3,4,5,6,7 Observations show that the last decade was the warmest in over a century. 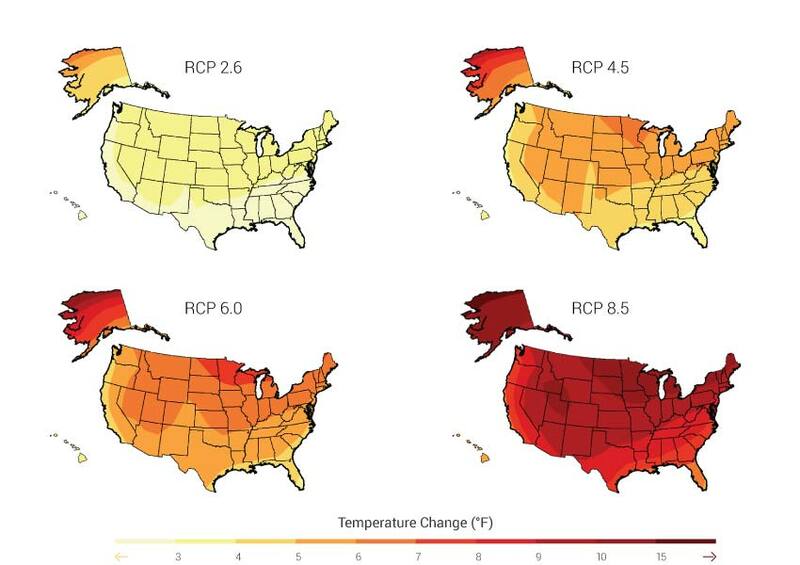 A number of climate model simulations were performed to assess past, and to forecast future, changes in climate; temperatures are generally projected to increase across the United States. The section entitled “Quantifying U.S. Temperature Rise” explains the rational for using the range 1.3°F to 1.9°F in the key message. All peer-reviewed studies to date satisfying the assessment process agree that the U.S. has warmed over the past century and in the past several decades. Climate model simulations consistently project future warming and bracket the range of plausible increases. A potential uncertainty is the sensitivity of temperature trends to adjustments that account for historical changes in station location, temperature instrumentation, observing practice, and siting conditions. However, quality analyses of these uncertainties have not found any major issues of concern affecting the conclusions made in the key message (Appendix 3: Climate Science, Supplemental Message 7). (for example, Williams et al. 20127). While numerous studies (for example, Fall et al. 2011;2 Vose et al. 2012;6 Williams et al. 20127) verify the efficacy of the adjustments, the information base can be improved in the future through continued refinements to the adjustment approach. Model biases are subject to changes in physical effects on climate; for example, model biases can be affected by snow cover and hence are subject to change as a warming climate changes snow cover. Given the evidence base and remaining uncertainties, confidence is very high in the key message. Because human-induced warming is superimposed on a naturally varying climate, the temperature rise has not been, and will not be, uniform or smooth across the country or over time. There have been substantial advances in our understanding of the U.S. temperature record since the 2009 assessment (see Appendix 3: Climate Science, Supplemental Message 7 for more information). These advances confirm that the U.S. annually averaged temperature has increased by 1.3°F to 1.9°F since 1895.8,1,2,3,4,5,6,7 However, this increase was not constant over time. In particular, temperatures generally rose until about 1940, declined slightly until about 1970, then increased rapidly thereafter. The year 2012 was the warmest on record for the contiguous United States. Over shorter time scales (one to two decades), natural variability can reduce the rate of warming or even create a temporary cooling (see Appendix 3: Climate Science, Supplemental Message 3). The cooling in mid-century that was especially prevalent over the eastern half of the U.S. may have stemmed partly from such natural variations and partly from human influences, in particular the cooling effects of sulfate particles from coal-burning power plants,13 before these sulfur emissions were regulated to address health and acid rain concerns. Quantifying long-term increases of temperature in the U.S. in a single number is challenging because the increase has not been constant over time. The increase can be quantified in a number of ways, but all of them show significant warming over the U.S. since the instrumental record began in 1895. For example, fitting a linear trend over the period 1895 to 2012 yields an increase in the range of 1.3 to 1.9°F. Another approach, comparing the average temperature during the first decade of record with the average during the last decade of record, yields a 1.9°F increase. A third approach, calculating the difference between the 1901-1960 average and the past decade average yields a change of 1.5°F. Thus, the temperature increase cited in this assessment is described as 1.3°F to 1.9°F since 1895. Notably, however, the rate of rise in temperature over the past 4 to 5 decades has been greater than the rate over earlier decades. Since 1991, temperatures have averaged 1°F to 1.5°F higher than 1901-1960 over most of the United States, except for the Southeast, where the warming has been less than 1°F. On a seasonal basis, long-term warming has been greatest in winter and spring. Figure 2.7: The colors on the map show temperature changes over the past 22 years (1991-2012) compared to the 1901-1960 average, and compared to the 1951-1980 average for Alaska and Hawai‘i. The bars on the graphs show the average temperature changes by decade for 1901-2012 (relative to the 1901-1960 average) for each region. The far right bar in each graph (2000s decade) includes 2011 and 2012. The period from 2001 to 2012 was warmer than any previous decade in every region. (Figure source: NOAA NCDC / CICS-NC). Warming is ultimately projected for all parts of the nation during this century. In the next few decades, this warming will be roughly 2°F to 4°F in most areas. By the end of the century, U.S. warming is projected to correspond closely to the level of global emissions: roughly 3°F to 5°F under lower emissions scenarios (B1 or RCP 4.5) involving substantial reductions in emissions, and 5°F to 10°F for higher emissions scenarios (A2 or RCP 8.5) that assume continued increases in emissions; the largest temperature increases are projected for the upper Midwest and Alaska. Figure 2.8: Maps show projected change in average surface air temperature in the later part of this century (2071-2099) relative to the later part of the last century (1970-1999) under a scenario that assumes substantial reductions in heat trapping gases (B1) and a higher emissions scenario that assumes continued increases in global emissions (A2). (See Appendix 3: Climate Science, Supplemental Message 5 for a discussion of temperature changes under a wider range of future scenarios for various periods of this century). (Figure source: NOAA NCDC / CICS-NC). Future human-induced warming depends on both past and future emissions of heat-trapping gases and changes in the amount of particle pollution. The amount of climate change (aside from natural variability) expected for the next two to three decades is a combination of the warming already built into the climate system by the past history of human emissions of heat-trapping gases, and the expected ongoing increases in emissions of those gases. However, the magnitude of temperature increases over the second half of this century, both in the U.S. and globally, will be primarily determined by the emissions produced now and over the next few decades, and there are substantial differences between higher, fossil-fuel intensive scenarios compared to scenarios in which emissions are reduced. The most recent model projections of climate change due to human activities expand the range of future scenarios considered (particularly at the lower end), but are entirely consistent with the older model results. This consistency increases our confidence in the projections. Figure 2.9: The largest uncertainty in projecting climate change beyond the next few decades is the level of heat-trapping gas emissions. The most recent model projections (CMIP5) take into account a wider range of options with regard to human behavior, including a lower scenario than has been considered before (RCP 2.6). This scenario assumes rapid reductions in emissions – more than 70% cuts from current levels by 2050 and further large decreases by 2100 – and the corresponding smaller amount of warming. On the higher end, the scenarios include one that assumes continued increases in emissions (RCP 8.5) and the corresponding greater amount of warming. Also shown are temperature changes for the intermediate scenarios RCP 4.5 (which is most similar to B1) and RCP 6.0 (which is most similar to A1B; see Appendix 3: Climate Science Supplement). Projections show change in average temperature in the later part of this century (2071-2099) relative to the late part of last century (1970-1999). (Figure source: NOAA NCDC / CICS-NC).